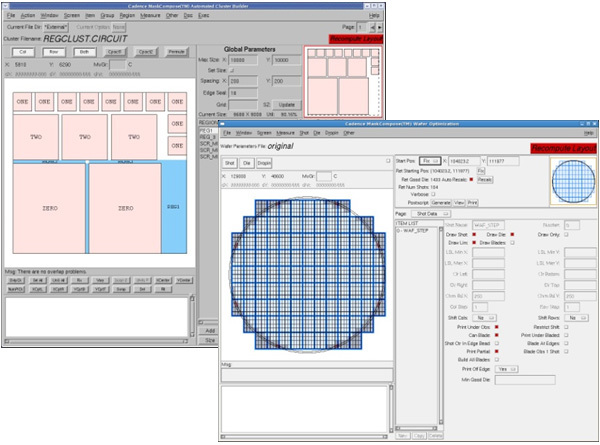 Cadence® MaskCompose Reticle and Wafer Synthesis Suite consists of a series of software modules that speed production and reduce errors in the tapeout flow. The modules work in concert to provide new levels of automation and efficiency, which includes automating the generation of frame/scribe databases, fracture rules, jobdecks, order forms, wafer maps, and customized paperwork to fulfill customer or supplier requirements. These design-to-manufacturing flow innovations reduce mask-making cycle times and cost while accelerating time to market. The Cadence MaskCompose suite allows us to rapidly generate in a highly automated way reticles, optimized wafer maps, mask order forms, and other necessary fab documentation for our customers’ designs.